The influx of people into the cryptocurrency market has made an astronomical rise in the adoption of blockchain technology. Numerous supporters, investors from different field of professions and businesses around the world have embraced new technological innovation which has helped reshape the world. 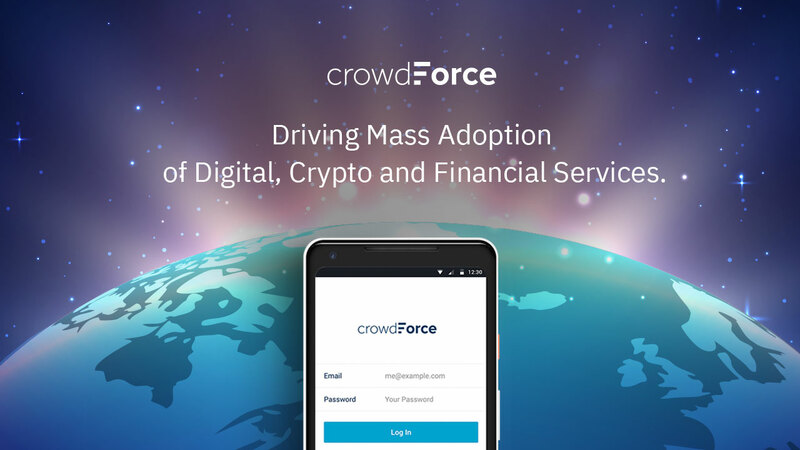 Basically the rise of cryptocurrency and subsequent attention brought to blockchain technology has prompted nearly every industry to evaluate the benefits of integrating the technology into their operations One firm at the forefront of this innovation is CrowdForce, a a platform that uses mobile technology and a network of micro businesses to help businesses, banks, Digital wallets and exchange companies scale to the next billion underserved population in emerging markets. 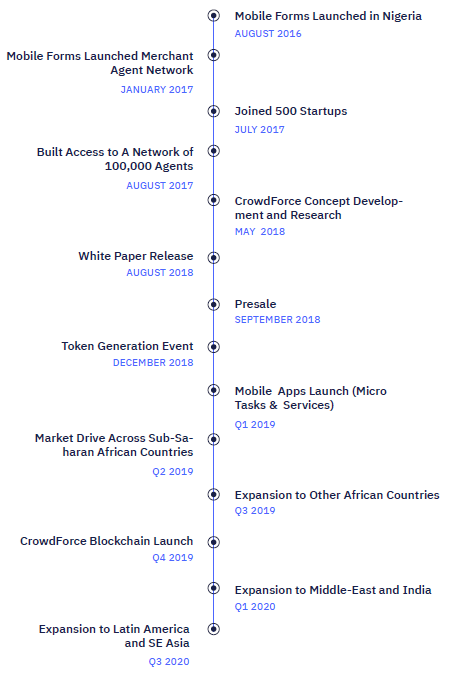 CrowdForce is a Mobile form platform for businesses, Non-Government Organizations (NGOs), and Government to crowdsource unfailing data in Africa using smart mobile technology and a network of one hundred thousand field agents. 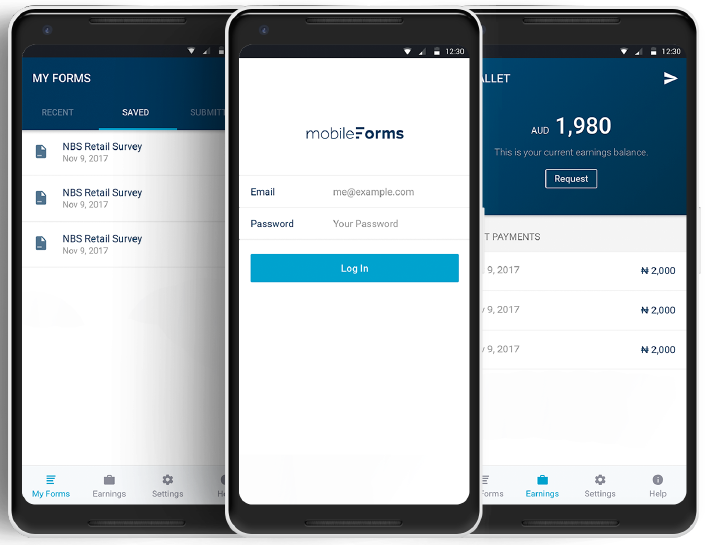 Mobile Forms is a worldwide Cloud-based Mobile data Collection platform that leverages the power to Field Agent Crowdsourcing and Mobile technology to deliver real-time business data to businesses, NGOs and Government. 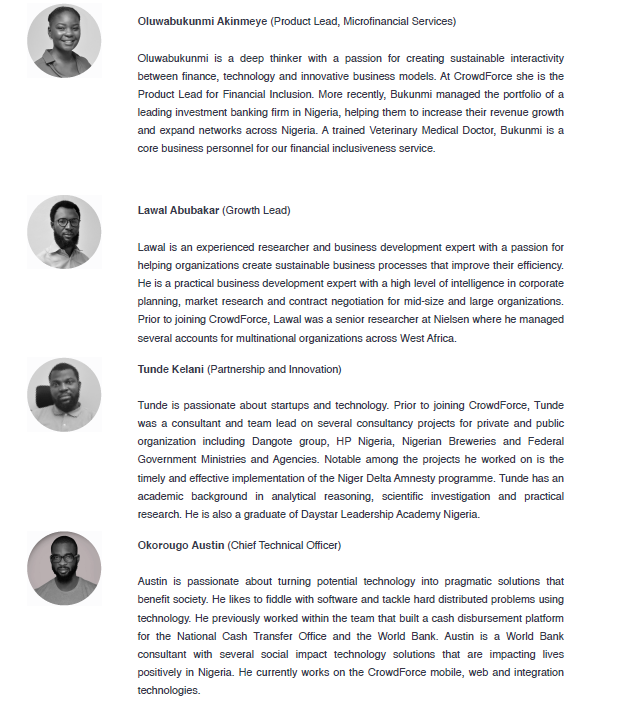 The Field Agent network is a combination of exclusive smartphone technology which can capture data anywhere either online or offline and social impact that will be used to solve a huge pain in Africa. This will empower smart young people on the ground to deliver strategic, local feedback that improves service delivery for organizations. 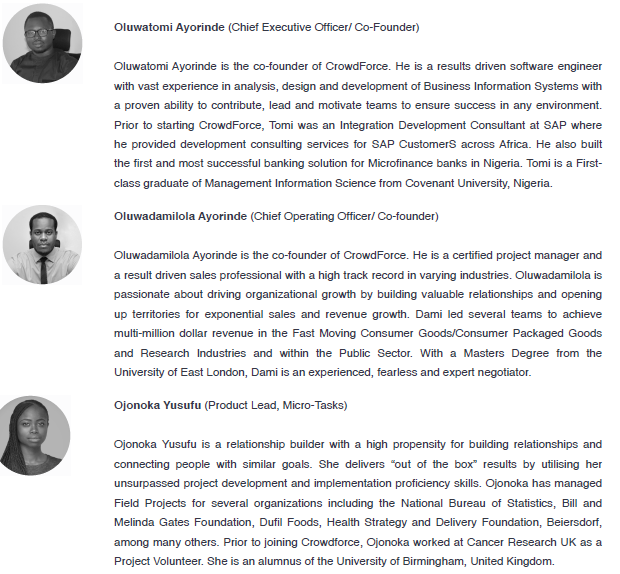 CrowdForce is passionate about transforming the way they collect data in Africa and they also empower local, international businesses and Non-Profits crowdsource a dependable market data through mobile technology and a network of field agents. Users can synchronize their Data proficiently to a central server immediately there is internet connectivity including areas in awfully poor connectivity. Admin Officers will be able to receive real-time notifications of submitted records. 4( Admin officers can review records and reallocated the data back to the user if additional details were required. Mobile Forms have the ability to capture GPS coordinates for Geospatial Data analysts to analyze the Mapping and geographical distribution of a health care center. The platform provides improved and quick access to reliable market data. Users get strategic and local feedback to advance service delivery in communities. Track progress in real time and respond to contributors with unfailing data faster than ever before. Geospatially map all zones and points of interest as well as health locations. Collect routine data to update decision models. The impact of Infrastructural investment decisions and crowdsource GIS data of every infrastructure locations and points of interests are measured. The supply chain dynamics and their impact on the community are evaluated. The CrowdForce platform user never misses an opportunity to get to know their audience. CrowdForce platform users can create and deploy tailored surveys. Users can discover new clients. CrowdForce platform users can leverage the platform to discover what clients need via a mobile device. Users will receive research-backed results that drastically improve marketing success. Users can have access to their survey data at any point in time irrespective of their location to get fast consumer feedback that informs their sales tactic. Users can generate customized forms to track key indicators and measure marketing operation impacts in real-time. Users can receive exclusive perception into changing conditions. CrowdForce platform users can expediently share data across teams, with access control. Measure the impact of policy decisions. Measure economic indexes on a periodic basis and also build economic models that authorize citizens and stakeholders to offer value. Conduct census and audits conveniently and build an unfailing National Database. Measure the impact of Infrastructural investment decisions and crowdsource GIS data of every infrastructure ecosystems and points of interests. Assessing supply chain dynamics and their impact on end consumers. Influencing Policy with Trustworthy Information by collecting important demographic statistics. Assess internal responses in real-time. Track key indicators for justifiable development. Enhance policy messaging using sound evidence. GO PAPERLESS AND GET ORGANIZED: they can create questionnaires, campaigns, and surveys through the application drag and drop form builder. They can also discuss projects with CrowdForce platform where experts can convert project core purposes into mobile form data collection. CAPTURE DATA: they can Share forms across all devices of their employees or field workers and can also set up a campaign and leverage CrowdForce diverse network of field agents to conduct campaigns, surveys, and data projects. ANALYZE DATA EFFICIENTLY AND MAKE BETTER DECISIONS: with the application the heavy lifting has been done already and tons of unfailing and certifiable data will be flowing into the user’s dashboard sporadically. Your data science team will be more organized and can also involve CrowdForce team of Data experts to support them with their expertise. The application will consist of initial microservices and micro-tasks as soon as the application is launched. Data authentication such as businesses, know your customer (KYC), and addresses. Image and GPS Capture of locations. Top up fiat (government issued currency) in a digital wallet. Cryptocurrency to Fiat (government issued currency) Exchange. 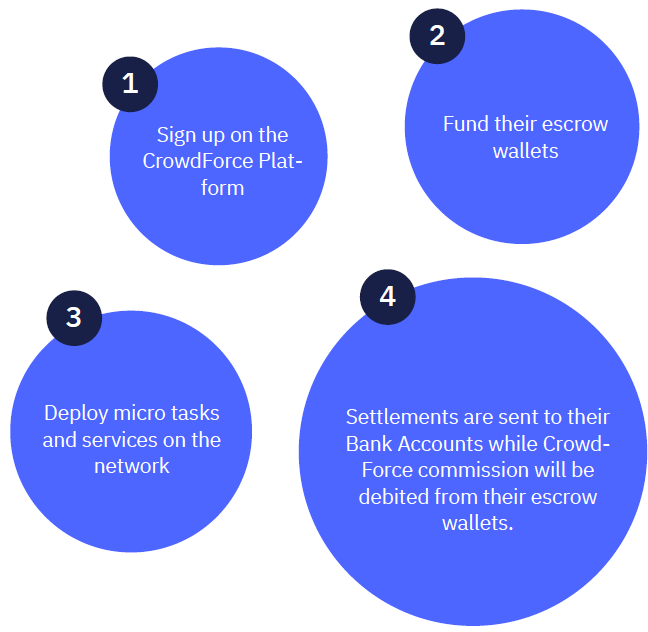 The CrowdForce token “CRF” is the native token of the CrowdForce platform. 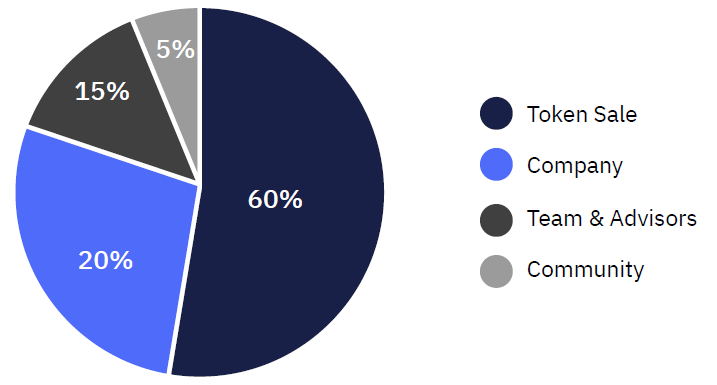 The CrowdForce token is a utility token that fuels the CrowdForce platform and it is used for all transactions within the platform. The tokens are an ERC-20 token compatible based on the Ethereum blockchain network. All unsold will be burnt. Please note that know your customer (KYC) is required for all token sales participation. All received funds during the token sales will be in the custody of an escrow (as an extra protection of the token for purchasers’ safeties) until the end of the sale of CRF tokens. Funds received from the sale of CRF tokens will be securely kept in an escrow and are transferred to CrowdForce after the end of ICO and instantaneously, users receive their tokens. Tokens will be distributed to purchasers after 14 days from the end date of Token Sale. 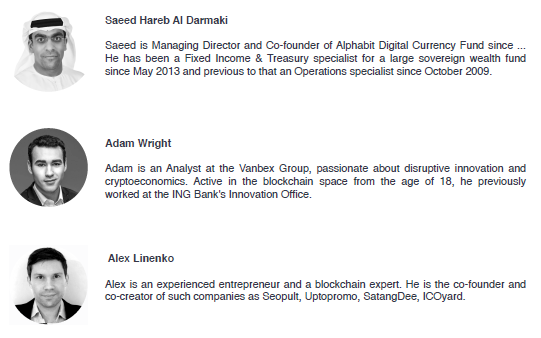 RESTRICTED/BANNED COUNTRIES FROM * PUBLIC PRE-SALE AND TOKEN SALE: USA, SOMALIA, SOUTH KOREA, AND CHINA. 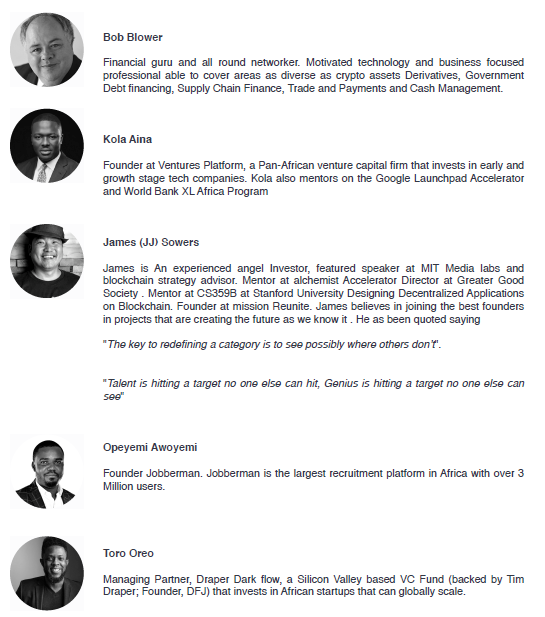 Ventures Platform is a Pan-African venture capital firm that invests in early and growth stage tech companies. DraperDarkFlow is a Silicon Valley venture capital fund investing in African startups that can change the world. 500 Startups is one of the world’s most prolific investors, with over 3,000 companies backed globally. 500 Startups portfolio companies include Credit Karma, Remind, Talkdesk and Udemy. Right Side Capital Management (RSCM) is a technology startup investment firm focused exclusively on the pre-seed stage. With a portfolio of 800+ pre-seed investments.